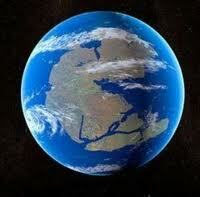 Eight hundred million years ago Earth’s landmass concentrated into one area forming a supercontinent called Rodinia. Parts broke away and shifted in a dance orchestrated by the hot core of our planet, and 400 million years later the parts reassembled into another vast landmass called Pangaea. If this is a periodic cycle then, as the continents move towards and away from each other, the planetary jigsaw must reassemble in the next 200 million years yet again.That future condition has been given a name, it is (will be?) called Amasia. Will there be humans in that distant future who will remember the name “Amasia”? Or any of the other names given today by science to its predicted oceans, its rifted terranes; like Avalonia, Carolinia? Most species have a lifetime of around ten million years. If homo sapiens sapiens was an average species then we would probably survive for another 9.8 million years. Unfortunately, the Sun is a relatively old star that is running out of hydrogen. It will begin to turn into a red dwarf in a couple of million years, its diameter will increase and it will swallow up Mercury, Venus and Earth. It seems that Amasia will never be. Not in the sense of some intelligent creature identifying it as such. Perhaps it will never happen in geological terms either: surely the expansion of the heliosphere will effectuate thermal equilibrium on Earth which, in effect, will bring the movement of tectonic plates to a halt. Perhaps humans will not be extinct in two hundred million years from now. Maybe we manage to survive, somehow. Not on the burned, dead Earth but as colonists of the Earth-like planets that we begin to discover today. Maybe our descendents evolve into another post-human species, genetically engineered to survive long interstellar travels or the different environment of other planets. Maybe then, say in a million years from now, no one will remember Earth, or its continents, Gondwana or Pangaea, or Europe, or Asia. Memories of the origin will be lost, buried under the heavy tomes of history-to-be; the epics of galactic explorers and colonists, the wars, the poems and the arts of the very distant future. Our Sun, having turned from yellow to red, will be a faint and forgotten glimmer in the sky of mutant humanity’s other homes.